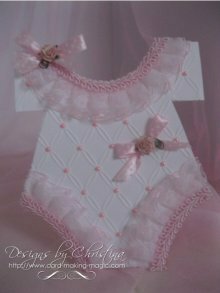 This fun and easy to make Baby Onesie card is an ideal way to invite your friends to your baby shower. Do you have cards to make for a baby shower? Or is there a new arrival in your family? Whatever the reason for making it, this little baby card just couldn't be easier. And the unusual design of this one makes it suitable for anything to do with a baby occasion !! But once you have the template keep it safe because then you will be able to use it over and over again. The video tutorial is not a long one ... but the beauty of it is that you can stop and re-wind it and follow along with me whenever you wish. There has been nothing special that has been used in the making of this card just items that you probably already have in your home. I promise you that it is not hard to do and that you will be delighted with the end result. You can use up all your pretty scraps of paper and card to make your card. Then add in flowers, ribbons and pearls, tiny gemstones or bows that would be in proportion for the size of the card. If you don't have any patterned paper then you can create your own pattern by running your shape through with an embossing folder. Any extra decoration around the neck and legs can be created from other card in your "Stash"